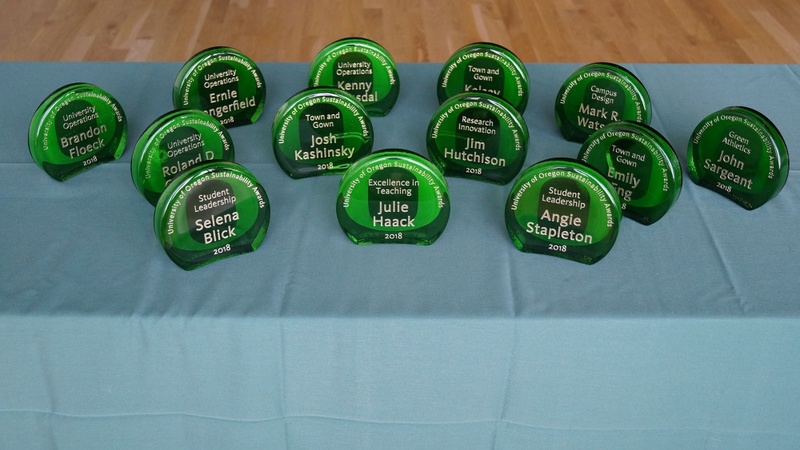 The Office of Sustainability recently honored individuals and projects from across the UO campus for their environmental efforts at the fourth annual Campus Sustainability Awards. The campus design award recognizes units or individuals who have demonstrated leadership and creativity in support of the Oregon Model for Sustainable Development and was awarded to Mark Watson for his leadership in the design of the new Allan Price Science Commons and Library. The town and gown award goes to individuals or groups for projects that promote, educate or enhance a more sustainable community. This year the award went to Emily Eng, Josh Kashinsky, and Kelsey Moore for their work on the new bike share program. This year two students, an undergraduate and a graduate, were given the student leadership award, which recognizes students whose extra-curricular efforts have made significant movement toward human equity, environmental vitality and economic well-being at the UO. This year’s awards went to Selena Blick, an undergrad environmental studies major, and Angie Stapleton, who is completing her master’s in public administration. Julie Haack, a senior instructor in chemistry and biochemistry, won the excellence in teaching award. The award honors a faculty member who has developed teaching and curriculum that reinforce and advance principles of sustainability through course design and instruction. The green athletics award recognizes an individual, team or departmental unit that is committed to enhancing and advancing sustainability within athletics. This year’s awardee is John Sargeant for sustainable food and beverage efforts at athletic events. The university operations award went to Ernie Dangerfield, Brandon Floeck, Kenny Ramsdal and Roland D. Guerrero. The award honors the outstanding contributions of individuals who support the use of sustainability best practices during day-to-day facilities operations at the UO. Finally, the research innovation award went to Jim Hutchison, professor of chemistry and biochemistry, for a project whose innovations were developed in the course of UO research and is now offered as commercially available products or services that improve sustainability. Videos about each of the recipients and their work can be found on the Office of Sustainability website.